Ok, so, until now, I’ve never made a Mardi Gras decoration in my whole life. In fact, the closest I have come to celebrating Mardi Gras was trying King Cake. But, in a few days I will be celebrating with the best of them in the heart of it all, New Orleans. In anticipation of my upcoming trip, I have been Google searching New Orleans and Mardi Gras like a mad man. During my search I came across bead trees. Which as the name implies are trees heavily decorated with beads. I encourage you to Google image search “Bead Trees New Orleans”. I find them to be magical. Feeling inspired, I created my own. I absolutely love how it turned out! So festive! So funky! 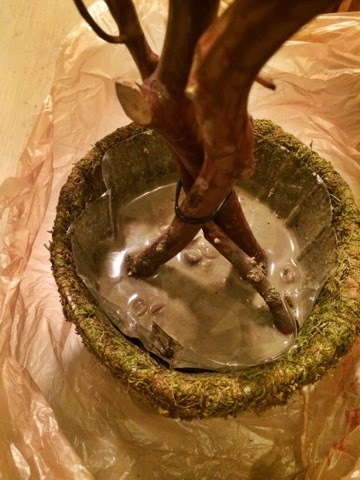 I simply mixed up and poured concrete in my pot to hold branches in place and give the container some weight. I let it dry overnight and then decorated the branches with beads. After Mardi Gras ends, just take the beads off your tree and you have a great base for other projects. I’ll definitely be using mine at Easter!